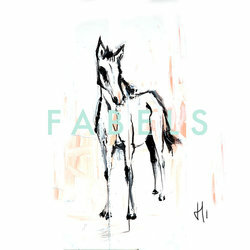 Fabels sterted in 2010 by Ben Aylward (guitar, drum machine, vocals) and Hiske Weijers (bass, keys, loops, vocals). They both have played in various bands before and salsoolo and both write songs. With their psychedelic and shoe gaze backgrounds they created a new original strong sound, from sweet dreamy songs to harder psychedelic repetition, swirling guitar sounds with haunting whispery vocals. Their first release was in 2011, an EP#1, then 2 more EP's before the first album 'Zimmer' in 2012 followed by a European Tour. Fabels have just released 'Hi' their 2nd album (after 2 more EP's)They have toured In Australia and are now heading to Europe to tour again. Fabels will be back in Australia in the summer of 2016/2017 to play in Sydney and more! Against it is mainly sung in French, starts kind and builds to a chant like krautrock repetitive sound which keeps changing and captures..